According to a MarketingProfs report, creating more engaging content is the top priority for content marketers in 2016. And the foundation of content? Words. Of course, this is true for lengthy written content like blog posts, whitepapers and case studies, but even in dynamic content such as video, infographics and podcast, words are pivotal to the creation process and each form demands the written word. These days everyone is creating content. Social media, guest blogs, emails; it is common to be called upon to create content even if it’s not your obvious role responsibility. But we don’t always have the time or flexibility to be a creative genius every day. So whether you write content every day or drop in and out, these tricks of the trade will make your life a lot easier, save you precious seconds, and keep your copywriting on track. Unless you are working on some extremely original content, chances are you can have a look around at how other people have done it. Sign up to newsletters, read some blogs, check out what downloadable content your competitors have. This isn’t to go around stealing ideas, but more will let you know what you like and don’t like and what is proven to have worked best. So when you’re tasked with setting up a new content type or rejigging the current format, have a look around—make a Pinterest board, ask your colleagues what they think of competitors’ content—and you’ll have a good basis on which to make decisions. Tools like BuzzSumo can show you which articles on a specific subject have proved to be the most shared over any time scale. This can be a great way to get clues as to what has been well received, or seen as useful content. When your thoughts are flowing, just write it out in the first words that come into your head. Pausing to think of a more sophisticated vocabulary to communicate that thought halts your creative process and the crux of your idea can slip away. You can go back and adjust afterwards. No one will ever be judged for having a thesaurus bookmarked on their work computer. Don’t be shy to jazz up your sentences with vocabulary gems you discover on the thesaurus and hunt for a word that really captures what you are trying to portray. Nothing helps expand your vocabulary like playing around on a thesaurus. When writing, many people focus on getting all their ideas down on the page and can continue on for a while, getting a good flow and hammering point after point of great content, sometimes getting a whole paragraph in one sentence while their readers pass out trying to get it all in one breath. That sentence is 54 words. Did you get lost in it? When the creative juices are flowing, it is very easy to get in the swing of things and let your sentence word count get out of control. This makes for a very confusing read, particularly online where readers tend to scan and pick out only select points to read properly. Your point gets lost in long sentences and the impact of your argument diluted. Punctuate the waffle and aim for no more than 35 words per sentence. If you find that you’ve gone over 35, review and restructure. Short sentences force your audience to pay attention. Shake it up with a mixture of short and long sentences to optimise engagement. Make it easy for your readers; wherever you expect them to take a pause, no matter how short, give them a comma. Losing the commas in this sentence would not alter the meaning in the slightest. The commas simply punctuate the sentence for clarity and ease of reading. So you’re knee-deep in a blog post about cloud storage. Fighting for inspiration through the murky mindset of Tuesday afternoons. A trick that transcends every industry, that never fails to find a new inspirational angle for your content: image quotes. Take a phrase that you’re working around e.g. 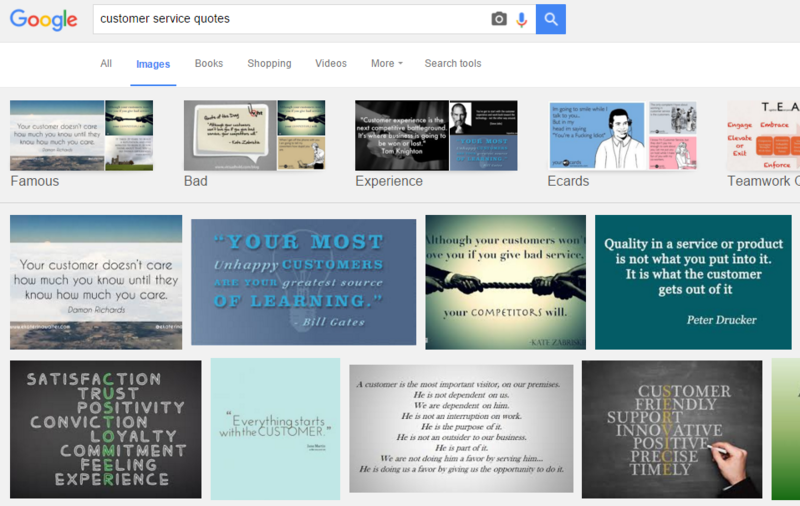 ‘customer service’, and type it into your Google image search bar followed by ’quotes’. What appears is thousands of colourful, inspirational quotes around that phrase, dressing it up and providing new perspectives and ideas. You don’t need to use the quotes directly, but you will be faced with a wealth of synonyms and new notions and ideas that can breathe some life into you writing. Particularly helpful when trying to coin catchy titles, try playing around with different versions of the phrase you’re working on e.g. ‘help customers quotes’ or ‘happy customers quotes’. Ever come across a word that you’ve seen a thousand times but all of a sudden you’re not sure if it’s ‘skillset’ or ‘skill set’? Should it be ‘while’ or ‘whilst’? ‘Water-skiing’ or ‘water skiing’? Very often, when creating content, your writing comes across phrases that you’ve never written down before. You know what it means and how to use it, but how do you write it? A handy tool for this is Google Fight. This tool calculates the visibility of one keyword versus another. For us copywriters, this means it tells us which version of a phrase or word is most popular in Google, so the most common use of the phrase which we can take on good authority for our writing. It’s a nice, quick fix that saves us from wasting time trawling Google, reaching for the dictionary, or asking around colleagues. Be careful with your British and American English standards. Unfortunately for us Brits, American English is dominant on Google so don’t be fooled into using American spellings (unless of course your audience is American y’all). Reading it aloud is a really effective way to check the quality of your content for accuracy, readability and appropriateness. Reading out loud forces your brain to properly register what’s on the page, rather than allowing your eye to scan past mistakes. Even better, get someone else to read it aloud to you. You might not notice that a sentence is clumsy and difficult to articulate until actually hearing it. The easier it is to read out loud, the more likely it is that your readership will stay tuned until the end. If you’re contributing to your company’s content in any capacity, it means you’ve got something to offer. Hopefully these tips will help you hone your ideas and produce fresh compelling content every time. Good luck! Do you have any more tips about copywriting? Let us know in the comments!